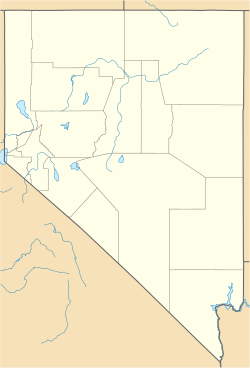 Skyland is a census-designated place (CDP) in Douglas County, Nevada, United States. The population was 376 at the 2010 census. Skyland is located on the east shore of Lake Tahoe in far western Nevada. U.S. Route 50 is the main road through the CDP, leading south 5 miles (8 km) to the California state line and northeast 20 miles (32 km) to Carson City. Lakeridge is immediately to the north, and Zephyr Cove borders Skyland to the south. According to the United States Census Bureau, the Skyland CDP has a total area of 4.4 square miles (11.5 km2), of which 4.4 square miles (11.3 km2) is land and 0.12 square miles (0.3 km2), or 2.26%, is water. ^ a b "Geographic Identifiers: 2010 Demographic Profile Data (G001): Skyland CDP, Nevada". U.S. Census Bureau, American Factfinder. Retrieved January 24, 2013. This page was last edited on 15 January 2018, at 19:38 (UTC).